PRAYER PROMPT ••• In 1 Corinthians, Paul talks about spiritual gifts. Honestly, while I don’t talk about it a lot here, spiritual gifts is one of my favorite topics to study. 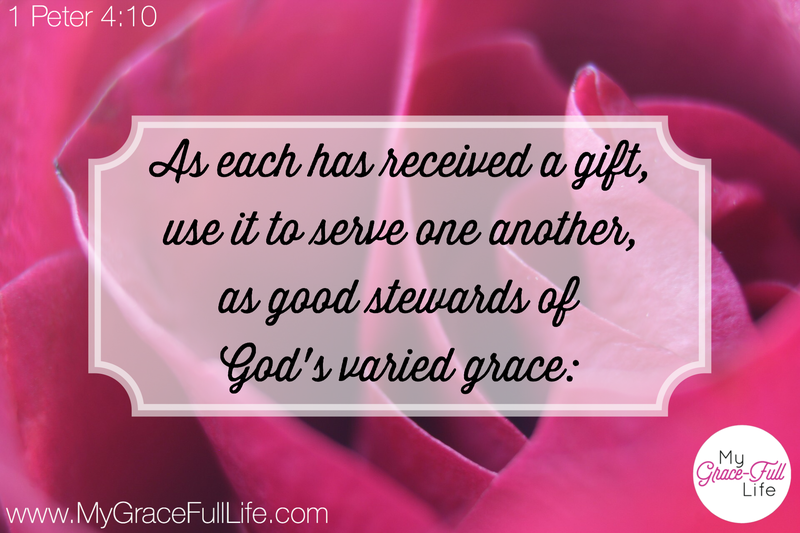 The Holy Spirit gives all God’s children spiritual gifts. We don’t have every gift listed in the Bible, but when we use what we have to His purpose, we are as blessed as those who benefit from the gift! In Charles Stanley’s book, “The Spirit-Filled Life” (which I highly recommend), he dedicated a chapter on making the most of our spiritual gifts. I decided to figure out what mine were and there are several online tests to help you identify them. One thing that really stuck with me though – Dr. Stanley pointed out that when we use our spiritual gifts for Christ, we are invigorated by them, and don’t grow tired from using them. I have found that to be incredibly true. Some of you have been kind enough to complement me on these daily prompts. I assure you – this isn’t me. When I started these in March, I made a list of topics that might have carried us for 30 days. We’re coming up on six months of daily prayer prompts and it’s because of the Holy Spirit. God gave me a gift for writing so I let Him use me. He’s responsible for this daily note and I’m just blessed to be the vehicle! On the other hand, one of my fellow Proverbs 31 volunteers sent me a card of encouragement this week. She’s done this several times and I love getting them! She’s brightened my day every time I’ve received a note from her and I know she’s letting the Holy Spirit work through her. I’d love to emulate her, but honestly, I’m the worst at sending cards! I’ll be the first to call you on your birthday but don’t expect a card. I’m not sure why they stress me out, but it’s not my gift! Another may use the gift of mercy… the gift of administration (another of my gifts – love admin work! )… the gift of teaching… and so on. Today, as you pray, ask the Holy Spirit to show you your spiritual gifts and open doors for you to use them for the church. Ask Him to give you the courage to embrace your gifts for the kingdom! Love your grace full life!! I love opening this to see what God would have you share with us each day. God bless you as you continue to write for His glory. Oh, I think we have a mutual friend, she writes an article each month for Forsyth Woman…..her name is Ava. She is the one who shared your post with me. Oh, the things I could tell you about her….but the most important one is that …she lead me to the Lord during a time I did not think my life was worth living…..she is a super special friend to me…..you can share this with her if you would like.